Have you found yourself on a downward spiral ever since the warmer weather faded and the sweatshirts and comfy sweaters and jeans and boots came back into the rotation and oh, the holiday season kick off!!! Forget the pumpkin pie at Thanksgiving – I couldn’t stop with the darn cookies!!! Anyway…if this sounds like you – let’s chat – because I was so riding that train and I am ready to say goodbye to those ways and help you do the same! I was doing some research on the top reasons why people aren’t reaching their health and fitness goals and I wanted to share with you all what I came up with and some tips I am applying NOW to overcome them! Lack of preparation: I’m sure you heard the saying but failure to prepare is like planning to fail. I used the whole “I’m busy” excuse and started lacking on my food prep and as a result my choices suffered, my dinner prep each night became more lengthy and it was added stress. Welcome back meal prep MONDAY! TIP: MAKE A PLAN! Even if its just for your dinners or just for breakfasts or lunches – MAKE A PLAN and then a grocery list, go shopping, prep things out and take action! We all start somewhere! 2. Not drinking enough water: You should aim to drink AT LEAST 1/2 of your body weight in water. For example if you weigh 150 pounds you should drink at least 75 ounces. Read on for some TIPS to drinking more water! 3. Not eating enough protein: The key is balance – you need balance in your nutrition and you need lean proteins! Here are some examples of things you may not initially think of when you think of traditional protein foods like chicken and fish but they’re great sources and help rebuild your muscles! Tip: Try to have source of protein with at least 4 of your meals in a day. Including this will help keep your metabolism going AND keep you fuller – longer! 4. Consuming too many liquid calories – Ok – this is pretty much self explanatory but the only “liquid” calories I will consume are within my superfood meal replacement Shakeology! And to be honest – I typically blend it like ice cream and eat it with a spoon so I don’t exactly consider that dense nutrition as “liquid calories” but nonetheless this is a place where you can really rack up the calories! TIP: Try something all natural like La Croix flavored sparkling water if you like the FIZZ without all the chemicals! I can find it at my local grocery store, occasionally at Aldi and always at Target! 5. Not enough sleep – Now I know all you mamas out there know this all too well but sometimes it takes a little reiteration for it all to come to surface! When we sleep – our bodies recover, we grow, we get ready for the day ahead. Not enough sleep will leave your metabolism slower, your mood dampened and your results….stagnant! While we all vary on the amount “needed” you should aim to get between 6.5 and 8 hours/night. My hubs has been my biggest fan here and practically pulls me into bed by 11:00 each night. It can be hard to shut it down but let’s be real – more sleep always equates to more energy – its the easiest equation to master. TIP: DON’T SNOOZE! Set your alarm for the true time you need to be up and get solid, meaningful sleep!!! And yes, I need to take my own advice!!! 6. Shopping the center aisles – How do you pick the right food and healthy food?!? First and foremost, by making a grocery list prior to going is going to not only make it easier on you, but save you money!! Next, look at you different food groups and pick out healthy foods/snacks that you have on your meal plan that you wrote out while in that planning stage mentioned above. I make my list by food groups (its easier in the store also when you’re searching). So veggies/fruits- they are all together, so pick your fresh and frozen, of course, skip through canned (full of sodium and chemicals), then add in your LEAN proteins, dairy and before you know it you just walked the perimteter of the store! You will likely head to the center to grab some carbs – just make sure you are reading the labels and picking 100% whole grains – NON-GMO!! Whether it is bread, wraps, crackers, flour. You want the complex, unrefined carbs where they have not been altered!! Brown rice and oatmeal are other goodies that will help you along the way!! Tip- Do most of your shopping on the outside of the store! That is where you will find your most natural and healthy food! 7. Skipping Breakfast – Think of your metabolism like starting your internal fire…the food you fuel your body with is going to get it all started and its going to start with BREAKFAST but you have to continue all day long. Tip – Prepare your breakfasts foods in advance. I do a quadruple recipe of my MANCAKES twice a week so they’re always ready to grab and go. EGG CUPS are a weekly staple and OVERNIGHT OATS are perfect for something filling, balanced, and ready to eat on the go! Of course there’s always shakeology – which is my no fail – never miss – breakfast necessity! 8. Not tracking your food – It may seem like a daunting task but tracking your food can tell you so much about what you’re really eating. MyFitnessPal is one of the best apps on your phone to help you keep track of everything!! Its easy to use, convenient, an ALWAYS with you!!! Sometimes we snack and snack until we do not realize the extra calories we are adding that we do not need!! 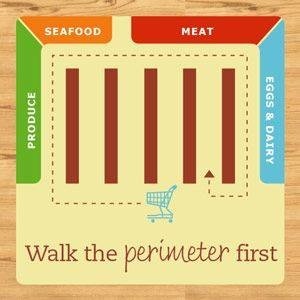 This will really help you target where you should be calorie wise with daily intake!! If you have not used it, I recommend at least trying it for a week and see if it helps!!! 9. Lack of Variety in your workouts – Sticking to the same routine can be very convenient, but at some point, this routine may not give you any results, so you need to shake things up. Changing the workout routine can be a motivator and may make things more interesting for you. I love how the 21-day fix gives you 7 different workouts for each day of the week and a few alternatives to add to the mix but even after a few rounds of that I need to switch things up! The reason for this is simple…with the repetition of the same type of workout, your body will get used to the exercise routine and will consume less energy. If you change up the exercise routine, your body will be continually challenged and it will burn more calories, resulting in a more successful weight loss. You can read more about WAYS AND WHEN TO SWITCH UP YOUR WORKOUT ROUTINE HERE. 10. Giving up too soon – Ever reach a goal and think “Man, I was just about to give up then…” – here’s the thing. 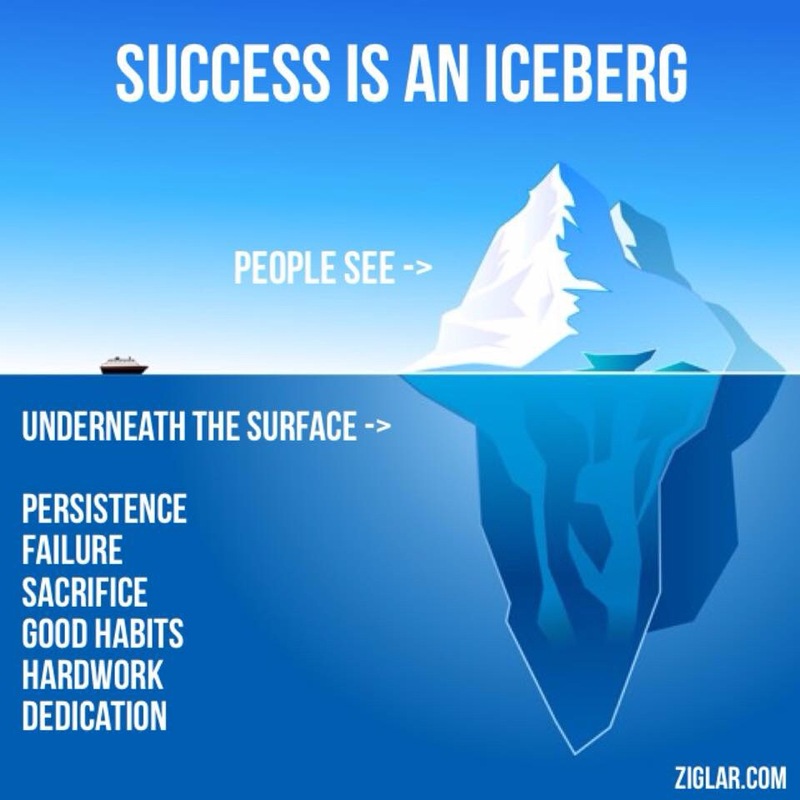 Success really is like an iceberg. There is a LOT of “stuff” that goes on behind the scenes or under the surface that you can’t see. But if you can be persistent – realize YES you will fail – make a few sacrifices and make that dedication to your goals – you will get there…but you cannot give up! I hope you found these tips helpful and motivating in the end help you reach your goals! 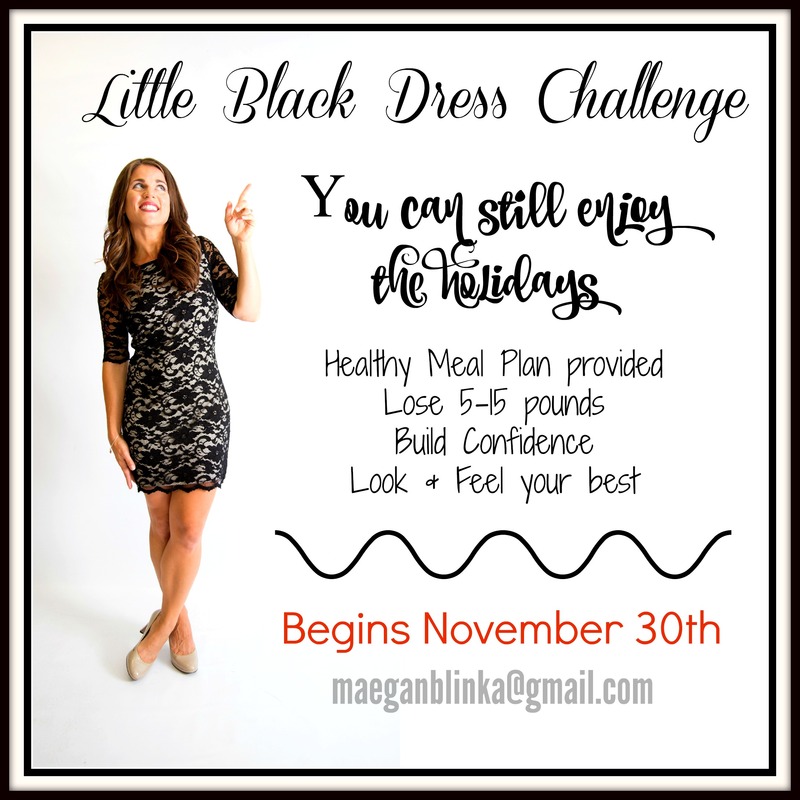 If you’re looking for some holiday accountability contact me about my LITTLE BLACK DRESS HOLIDAY SURVIVAL group! Its time to get Hammered!